With Earth Day around the corner, finding ways to re-use or recycle is at the top of my to-do list. The other night, while making dinner, that flat styrofoam meat tray reminded me of an educational and enjoyable art activity I used to do with students. I decided to save that ugly yellow meat tray and turn it into something lovely instead! Before heading down the art-with-used-meat-tray activity path, it’s essential to clean the styrofoam. I use lots and lots of dish soap to wash trays, and dry them overnight before using. This ensures no icky-sick potential. Cut the sides off the meat tray along with cutting it to a size you want to work with. Then, you can use a pencil to draw a design onto the tray. Don’t go crazy or anything – you aren’t trying to press through the tray, just make an indentation. If you want to make a detailed design, you can print out or draw a design on a sheet of paper and then tape it over the styrofoam – just trace over the design. When finished with your drawing, paint over the tray with tempera, acrylic, or watercolor paint. 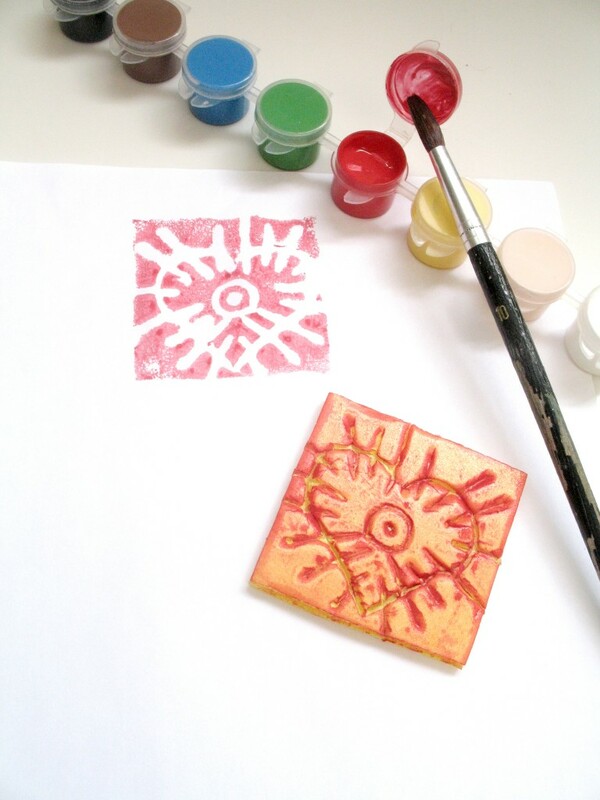 Press the tray onto a piece of paper and check out the cool print you made! You can re-use the stamp by washing it with water and then stamp and stamp away! The great thing about this project is that pretty much anyone can do it – even little kids. The design might be a ton of crazy lines, but kiddies will be proud of the finished product. Adults can get in on the action, too. And, you might find yourself getting quite caught up in creating unique designs. I enjoyed playing around with making these styrofoam stamps while my daughter was napping. What a great way to contribute in keeping Mother Earth safe and clean. And the kids and adults get a great project out it. It’s a win win for everyone involved. I love this idea!